Mary Hawkins recently mentioned that nobody on this website appears to remember Dunton Drive. Therefore I decided to write a little about her family and childhood home. Dunton Drive was situated approximately halfway between Laindon and Dunton. From the eastern end of Merrylands Chase, Dunton Drive ran south to Victoria Road, passing the western end of Merrylands Road and Topsham Road on the way. A little further west and running parallel, was Victory Avenue, which contained Victory Close and Wimborne Avenue. A little further west, running parallel was Lower Avenue. During the twenties, Mary Pratt’s parents May and William decided to move to a bungalow in Laindon. They arrived at Laindon Station and after a long walk with their young daughter Kathleen, via Worthing Road, they arrived at Dunton Drive. They immediately fell in love with the bungalow and its very large garden which had previously been used as a weekend retreat. Decided to buy it, moved in and named it ‘Malvern’. The family loved their new home in the countryside, made friends quickly and became part of the community. Soon daughter Eileen was born followed by little sister Mary in 1935. Mary gives an interesting account of her childhood on an adjoining website. Go to the menu on the left of our home page, click on ‘Information’, then ‘Links to other websites of interest’, Dunton Plotlands, Dunton Drive. Around 1936 a member of Mary’s family recorded an excellent cine film of life at ‘Malvern’ and some footage of the Laindon Carnival. During the war years Dunton Drive suffered its share of incidents, including 2 HXE explosives that dropped late in the evening of the 19th April 1941, damaging several bungalows. Mary left Laindon High Road School in 1949 and married Peter Hawkins in 1954. I spent my childhood in a bungalow in Alexandra Road, which I now realise wasn’t very far from Dunton Drive. I never ventured any further west than Richards’ farm ‘Sunnymead’, when I ‘played out’, however I now wish I had gone exploring. I’m sure Mary and I would love to hear from anybody who remembers Dunton Drive along with any stories they would like to tell about the area and the families who lived there. Any photographs would be very much appreciated. Below is a list of the bungalows and occupants in Dunton Drive from the 1949 Electoral Register. The Grange – Matilda and Benjamin Osborne. Rose Lodge – Florence and Edward Andrews plus Lily Mears. Grace Cottage – Margaret and Sidney Blackwell. Faramax – Amy, David and Leslie Bumpsteed. Homeleigh – Florence and George Quinton. St. Davids – Florence, Joyce, Winifred and Albert Wiggins. Sarahville – Louisa and George Morgan. Retlaw – Gladys and Henry Gowlett plus May and Percy Leech plus Louise and George Morgan plus Arthur Watson. West View – Marie and Alfred Paddon. Belvedere – James Day. Rose Cottage – Agnes and Stanley Overy. Cotswold. – Mary and John Palmer. Rosemary – May and Harold Lloyd. St, Ives, Alice and Horace Harvey. Niagra – Ethel and Edward Sharp. St. Monica – Grace and William Woolgar. Ansfield – Ann and Alfred Merry. Lily Bungalow – Rose and Albert Frasi. Willows – Mary and John Moore. Oakfield – Maud, Stanley and Thomas Lowther. Laurel Cottage – Agnes and William Goldsmith. Sandale Villa – Ellen, Matilda, Matilda E and Fred Shepherd. Karina – Kathleen and Victor Simmonds. Malvern – Gladys May and William Pratt. Tamar – Mary Hallett. Saltash – Rose and Harold Hallett. Gordonville – Gertrude and Ernest Burton. Formosa – Rose and Reginald Cox. Armadale – Stella and William Finch. Dunton Drive and surrounding area. My name is Tess Germain. I was born at STANTON, Victory Avenue. I went to Dunton School (infants) from 1948 to 1951 approximately. Born at the above house in 1944. My brothers Terrence William and Roy who was the eldest, went to Laindon High Road School until they were all around 14 years old. Roy was there still in the early 40s, as were the other two. The house was compulsory purchased in 1951 before Basildon was built and we moved to Takeley. I was talking to my son who said he works for FORD and that he occasionally went to Dunton. I then said I was born there, hence looking this up. Victory Avenue pathway/pavements were built by my dad William, and my mother was ‘Doll’. Hi, It’s nice to read the old memories of Laindon and see the photos. My nan and grandad, Ethel and Edward Sharp lived at Niagra, Dunton Drive, we visited quite a few times, uncles aunts and cousins. Grandad had what looked like a racing horse to me, we rode it with no saddle. I would love to know where grandad was buried in Billericay 1950 or any stories. Cheers, Brian. Editor: As he lived in Laindon, it may well have been at St Nicholas Church, Laindon. I will make some enquiries. Hi, many thanks Ed’ cheers, Brian. Having visited the Plotlands Museum to trace the exact whereabouts of my father’s home, David Bumpsteed, who lived at Faramax with his mother and brother. 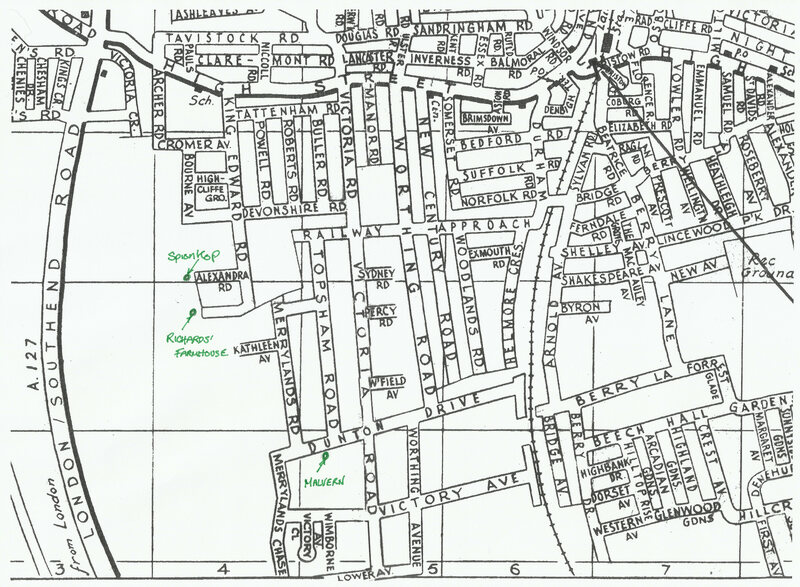 His father, Edward Bumpsteed, was a draughtsman and drew plans for many of the homes there. If anyone knows any more detail, I would love to hear about it.